Everyone grab your guns, it’s a coup d’état! “Reply” completely changes the game – or at least the government – as Erwin’s plans finally come to fruition. I have to say, last week’s episode had me worried for Erwin. I was absolutely convinced that he was going to be executed in “Reply”, but instead Pyxis staged a false Titan attack to reveal the true nature of the government, which seems to align with all governments everywhere in being full of conniving jackasses who only care about power and not about the people they govern. Luckily, this happened in front of enough members of the military to convince them that the coup was a good idea. Unfortunately, the people are likely to not be so easily swayed. A lot of great philosophical questions in this episode. 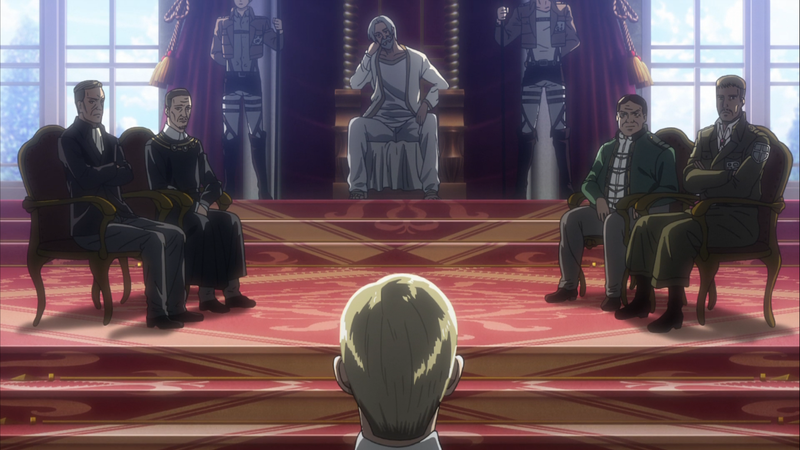 Erwin knew that the government was corrupt, but he still isn’t sure whether or not a coup was the best thing for humanity. As he points out, they had managed to keep humanity alive for the past century, so they clearly knew what they were doing. Also, Erwin wondering if he was a bad person because he wanted to live so badly that he may have endangered everyone. Some real deep thinking from an anime about giants that eat people. All of the questions now are on Eren. Armin’s ponderings have been things I’ve been thinking about since the beginning (like, seriously, what is in the basement? ), I just don’t know if my theories have any chance of happening. I thought I knew what happened, but now I’m not so sure. We know Grisha injected him with something, and until this season, I assumed that Titan shifters just had to eat a person, so I thought Eren had eaten his father. But now thanks to “Reply”, I’m wondering if maybe the Reiss family had something to do with it? Hange certainly seemed to be hinting that the chapel was destroyed by Titans and the attack was covered up and blamed on bandits. Did Eren eat the Reiss family? He definitely had one of Freida’s memories. Was Rod complicit in this, or was Grisha “stealing” the coordinate power from the royal family and now Rod is taking it back? I knew Fritz was a fake king, but he looked so badass and sure of himself. Turns out he was sleeping with his eyes open! I snorted. I also snorted at the scene where our intrepid heroes celebrate no longer being outlaws, except cool as a cucumber Levi, just chilling with the newspaper. With Ymir gone and a parent finally showing her some affection, will Historia switch sides? SERIOUSLY, WHAT IS IN THE BASEMENT? What did you guys think of “Reply”? Previous:Iconic Rangers Return in Power Rangers 25th Anniversary Trailer! New Series To Debut in 2019!